Mr and Mrs Allen had a 4kW all black Mono system with Enphase inverters fitted on 21st November 2013. It was predicted to produce 4052 kW hours. On the 20th November 2014, after exactly one year it had produced 4280 kW. That is enough energy to run 416 homes for one day and offset 3.06 tons of carbon which is equivalent to 77 trees. This home is now rated as a B 86 on its Energy Performance Certificate. 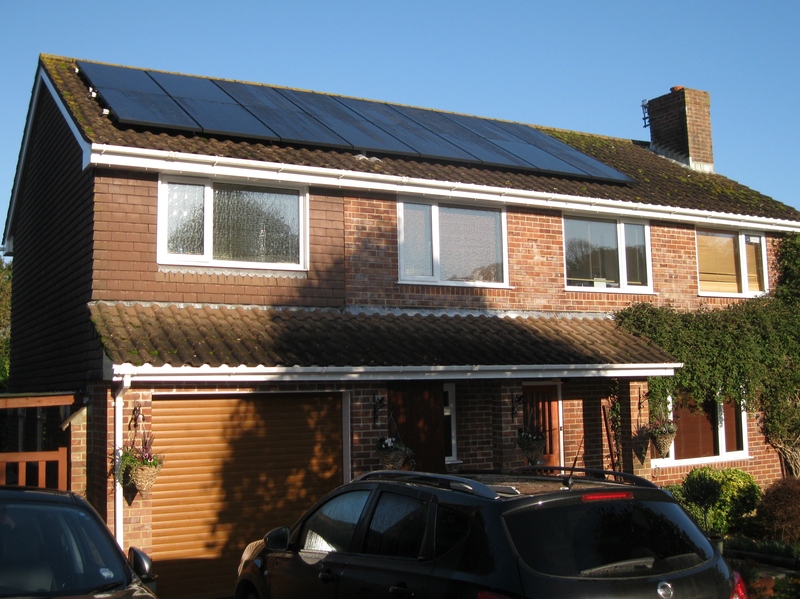 On Friday the 1st November 2013 we fitted this twelve panel PV system for Mr and Mrs D of Bognor Regis. This is a 3.12kW system with all black Phono modules and Enphase micro inverters. The installation was split over two roofs neither of which are perfect South facing. Using the SAP method we predicted an annual generation of 3118 kW hours and exactly one year later the system has produced 3430 kW hours. This system is producing 10% more than our predicted returns. 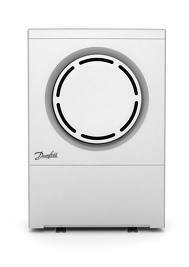 They also have an iBoost which resulted in the gas company querying the very low summer quarter`s meter reading. We recently received this email from Mr and Mrs Walshaw who live in Swanage , Dorset. Their twelve panel system was fitted on 07/09/2011. 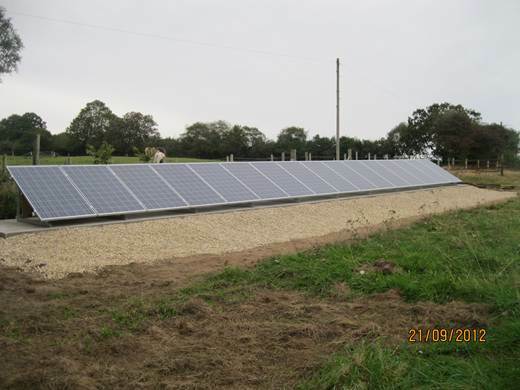 We continued to be very satisfied with the performance of our 12-panel system.You estimated an annual output of 2437 kWh and over the past 3 years we have averaged 2979 kWh. Mr H. of Down Thomas near Plymouth had an oil boiler up to the 13th September 2013. 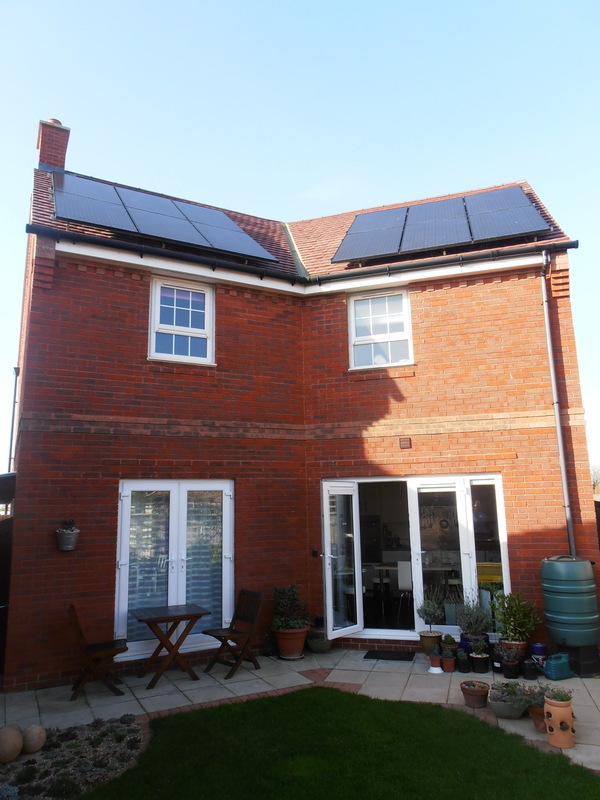 NGPS supplied and installed a market leading Danfoss AQ air source heat pump and a nine panel Phono PV system with the market leading Enphase M215 micro inverters. The oil boiler and storage tank were removed. Hi Nick, I thought you might be interested in the following figures, which are taken from a year’s worth of readings on the electricity meters (mains input and solar panel generation) and the Heat Pump. Note that I have no other power supplies to the house. This means that my nett power consumption for the house, for all purposes (cooking, fridge freezer, central heating, hot water, lights, TV, Wifi etc), is 998 kwh over the year. With the rates I am paying for electricity from EDF and receiving for generating electricity from the solar panels, this works out at an expenditure of about £70 for the year! 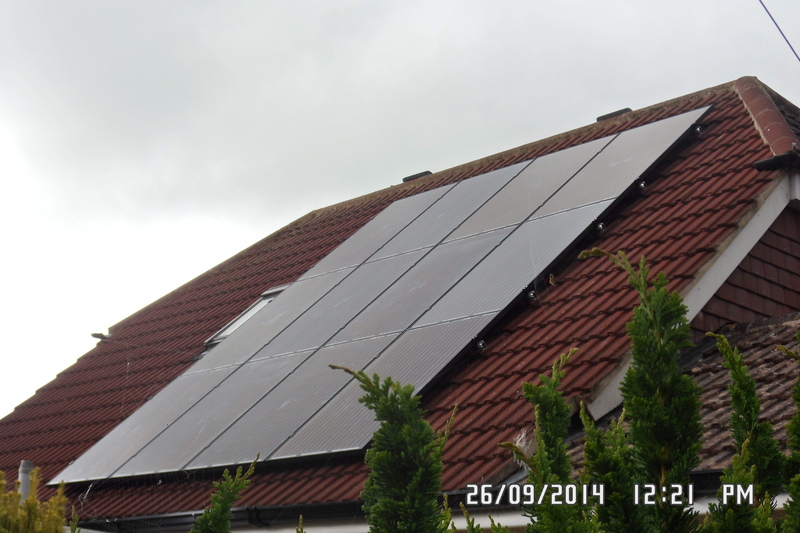 A 3.12 kW solar PV system comprising twelve Phono 260 watt all black Mono modules with Enphase M215 micro inverters. This system has a 25 year warranty and has a twenty year guaranteed return on investment of over 11%, based on current import prices. This roof could easily have had a 4kW system with more panels but here at NGPS we think neat blocks of solar panels look better and have less impact on housing resale values. 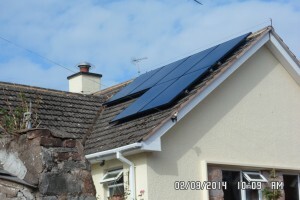 A 4kW system split across several roofs for Mr and Mrs G. of Exeter in Devon. Featuring the market leading Enphase M215 micro inverters and Phono all black modules with an iBoost for free hot water. This system set to produce over £700 a year in FITS and export bonus guaranteed for twenty years. The FIT rate is tax free and index linked. Including import savings this system will pay for itself in six to seven years based on current import rates and shows a return on investment of over 12% per year. 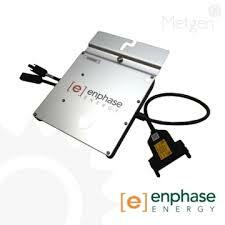 The Phono panels and the Enphase inverters come with 25 year warranty. This Phono 260 watt all black module system features the Enphase M215 micro-inverters with no single point of failure and 25 year warranty and the ability to check generation in live time on computer, tablet or smart phone. A four kW ground mount system in Lytchett Matravers near Poole for Mr and Mrs A.
NGPS supplied and installed the concrete mounting plinth, and buried the armoured cable back to the property. 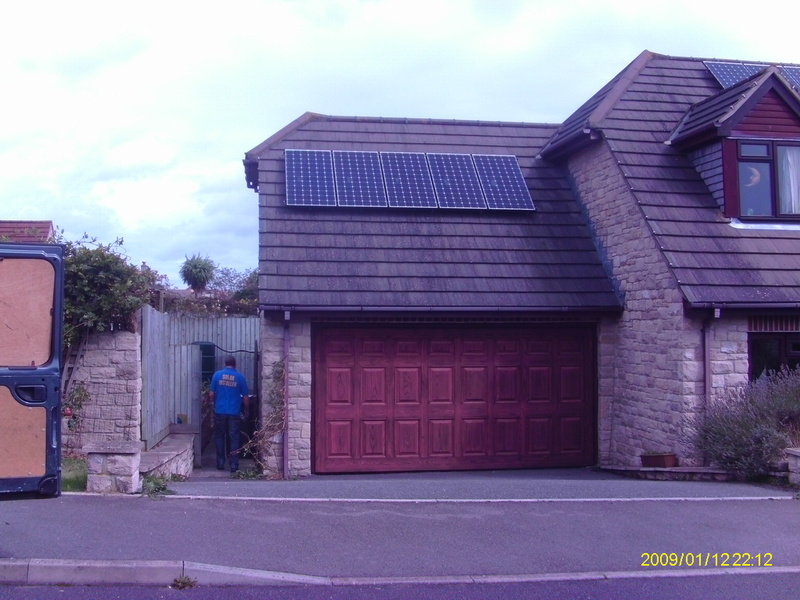 This 4kW South facing, unshaded system will save the owners over £500 a year in import electricity costs and produce a feed in tariff income of over £700 a year guaranteed for twenty years. Thats a tax free income of £14K added to savings of £10K based on todays import costs. 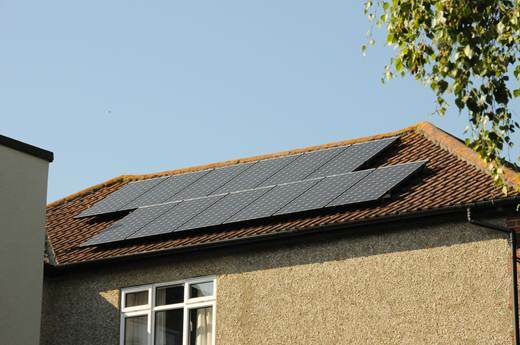 The feed in tariff is index linked and according to the Energy Savings Trust electricity import costs double every seven years. Solar still providing a minimum 10% tax free return on investment ! 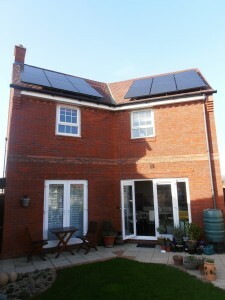 A 3.84kW Sanyo HIT240N system for Mr and Mrs B. in Portsmouth. 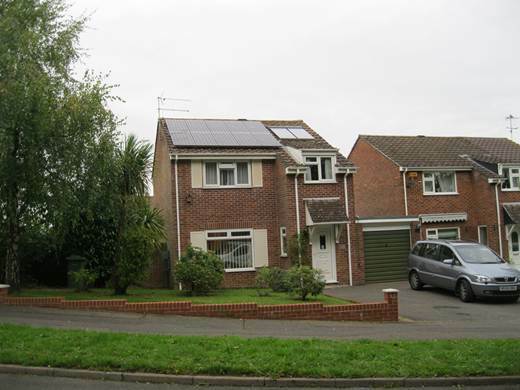 Another top of the range Sanyo system split 12 modules South and four West for Mr and Mrs B. in Portsmouth. 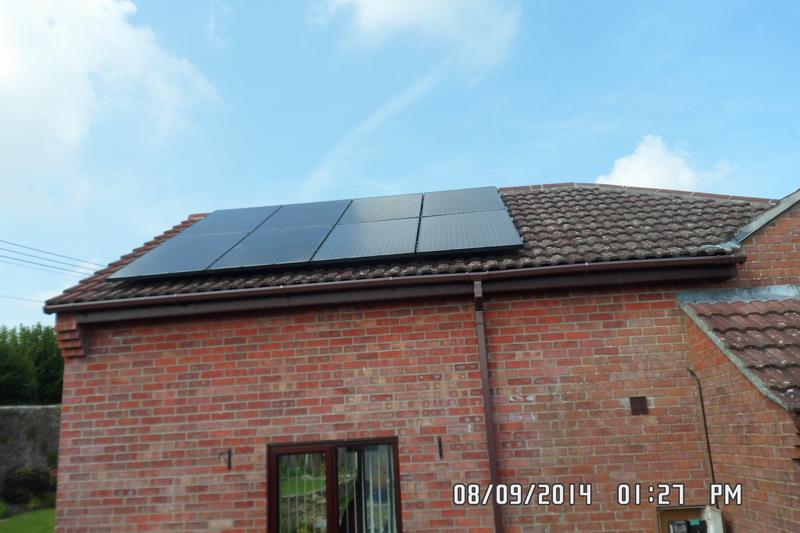 This system set to produce over £1500 a year guaranteed for 25 years with the feed in tariff. 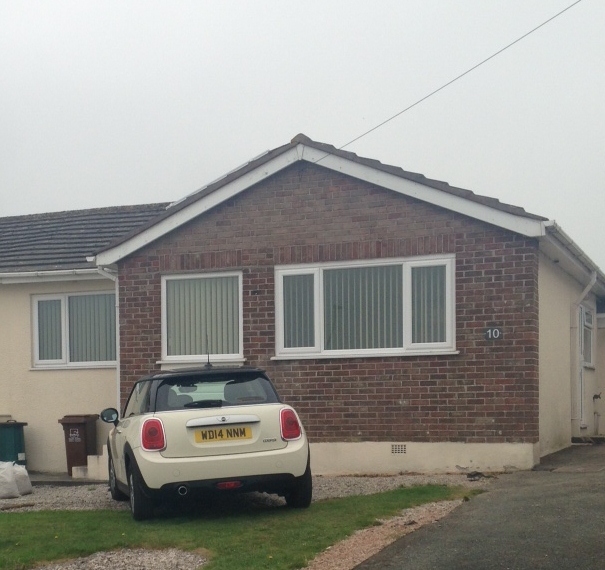 Thats over £37K , tax free and index linked for a £13K investment. Plus the savings on electrical import costs of around £4000 over 25 years, based on current prices. A 2.4kW Sanyo HIT 240 system in Merley near Wimborne for Mr and Mrs A. 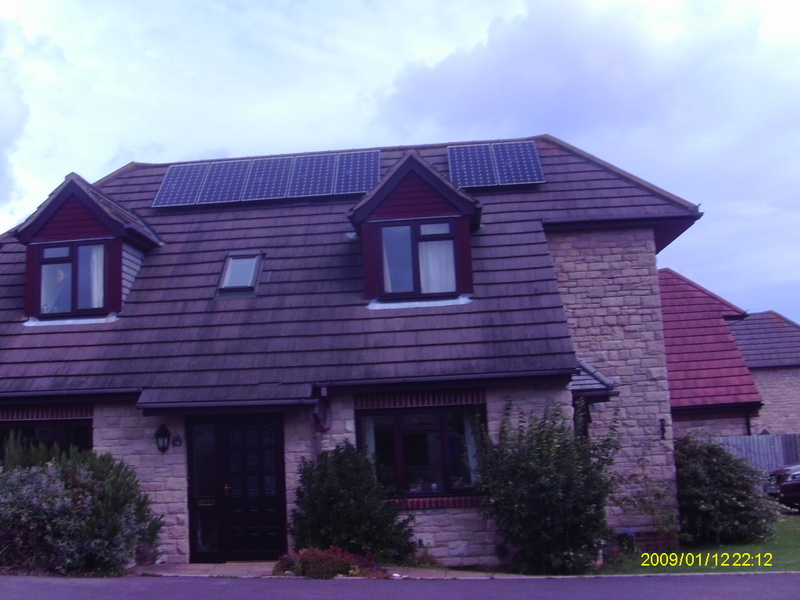 This £10K system which included replacement mains board , repositioning the solar thermal system and VAT will reduce the electrical import costs by at least a third and provide the owners with feed in tariff payments of at least £1000 a year , tax free and index linked, guaranteed for 25 years.